At the Good Food Institute, few questions come up more often than “have you eaten clean meat?” (answer: not yet, but I can’t wait) and “when is clean meat going to be on shelves?” I just answered the first question, so let me take a few moments on the second. And let me preface this entire discussion by offering my thanks to our senior scientists Christie Lagally and Dr. Liz Specht for making sure I got all this right and for prompting this post, the genesis of which was Christie’s enthusiasm after the Maastricht conference. She came back and declared that “clean meat is well underway to sustainable production” and “even closer” than she previously thought. Her enthusiasm is backed by the two people who probably know more about the technology than anyone else on the planet: Dr. Mark Post, and Dr. Uma Valeti. Dr. Mark Post is widely thought of as the father of clean meat. He proved that tissue engineering could be used to create food when he debuted the world’s first clean meat hamburger in 2013, and has since gone on to found clean meat company Mosa Meats. Dr. Post held teaching positions at both Harvard and Dartmouth Medical Schools before taking over as the Chair of Physiology and Vice Dean of Biomedical Technology at Maastricht University. Dr. Uma Valeti is the CEO and co-founder of Memphis Meats, the company that created the world’s first clean meatball in 2016. Before embarking on his mission to save the world with food technology, Dr. Valeti was already saving lives as a cardiologist. He trained at the Mayo Clinic, taught at the University of Minnesota Medical School, and was President of Twin Cities chapters of both the American Heart Association and American College of Cardiology. These are the two guys who know the most about this technology, and despite the fact that they could do just about anything, they’ve dedicated their lives to advancing clean meat. That’s a pretty impressive vote of confidence. 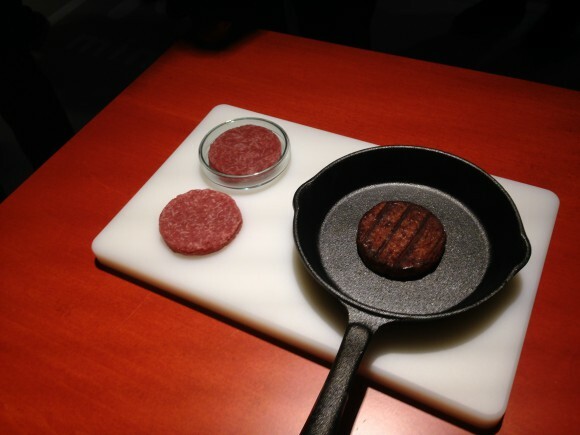 While advances have been made since Post’s first hamburger patty, there’s still plenty of work to do to get clean meat to market within five years and making it cost competitive with conventional meat with ten—the goals publicly set by both Post and Valeti. Bringing down the costs involved at each stage of the process is probably the most critical hurdle to clean meat commercialization. Luckily, dramatic cost-reduction has already been achieved, and the price of production continues to fall. To put the developments of the past few years into perspective, Mark Post’s first burger cost $330,000 to produce, and within a few years, Memphis Meats was producing meat for less than one-fiftieth of that price tag. By 2020, Post plans to sell Mosa Meats’ burgers for about $10 a patty, and within about five years after that, for about the cost of the least expensive meat on the market. One way to understand clean meat’s scientific path to commercialization is to envision a system of intertwined gears inside a clock, all of which need to move in tandem to function effectively. In this clock, there are four critical “gears” to pay attention to: cell lines, media (a.k.a. growth serum), scaffolding, and bioreactor scale-up. At its most basic, clean meat production involves growing a small sample of cells into a full-fledged piece of meat. That initial sample is what is called a cell line, which you can think of as the “starter pack” of clean meat. These lines contain the different types of cells—muscle, fat, and more—that are then proliferated in cell culture. The science behind this process is already well advanced thanks to extensive research on tissue-engineering in the medical field. Now, it’s up to motivated researchers to take the wealth of knowledge gained from this medical research and apply it to clean meat production by establishing animal cell lines. At this point, you might be wondering why anyone needs to “establish” cell lines if we can simply take direct samples from an animal. There are two primary reasons for this. When cells are obtained directly from an animal, they only have the capacity to divide and grow a limited number of times (20–50 times, in case you’re curious), leaving companies and researchers in need of new samples frequently. This is not only impossibly inefficient for large-scale production, it’s also counter to the objective of entirely removing animals from the meat-production process. One solution is to establish “immortal” cell lines that can be shared between clean meat producers and used as a consistent, indefinitely reproducing source of meat. While even differentiated cell lines can be immortalized through genetic tricks, pluripotent and multipotent stem cells—which can differentiate into all of the necessary cell types within the final product—are often naturally immortal, making these especially appealing for clean meat applications. An exciting recent development in this area occurred when New Harvest research fellow and North Carolina State University graduate student Marie Gibbons, along with her adviser Dr. Paul Mozdziak, successfully grew a small turkey nugget from an immortal cell line they created. With access to this cell line, any scientist could produce the same results in just over two weeks. Compare that to raising a turkey from birth to slaughter--which takes about 6 months and wastes more than 90 percent of the caloric inputs—and you’ll understand why advocates for sustainable food production are so excited about this technology! Once cell lines are widely available, production moves to the next step: connecting these cells with the nutrients needed to replicate. These nutrients are commonly referred to as “media.” Media is a mixture of ingredients that works as a food source for cell lines, encouraging them to grow and divide. As it stands, researchers often rely on animal-based serum to get their small sample of cells to grow. This is problematic not only because it relies on animals, but also because serum is notoriously inconsistent from batch to batch, is in limited supply and thus extremely costly, and carries a risk of pathogen contamination. 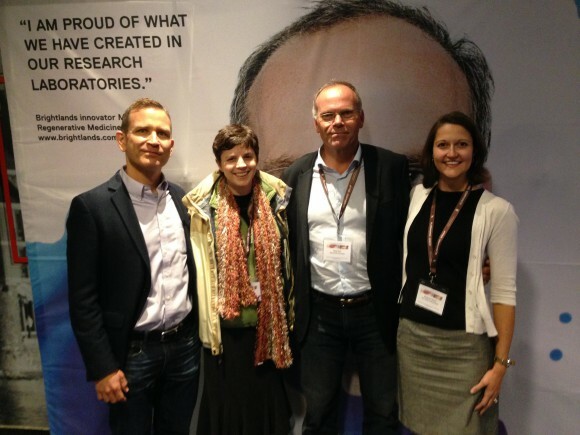 GFI’s Senior Scientist Liz Specht presented on this topic at the Cultured Meat Conference and mapped out the way forward on animal-free media. Quite simply, there will be no animals used in media by the time clean meat is commercialized, for both ethical and practical reasons. 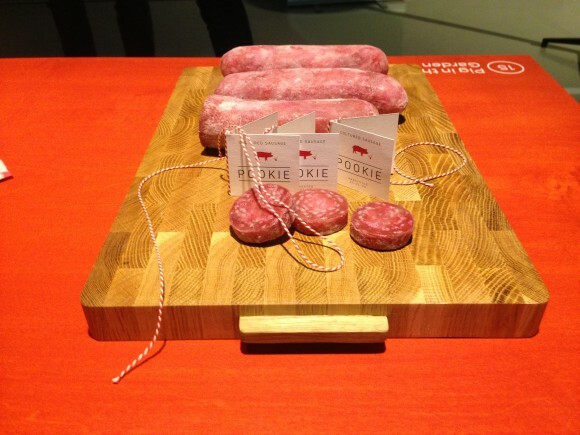 Conceptual presentation at the Cultured Meat Conference: “Pookie” the pig is said to be alive and well! Fortunately, hundreds of animal-free media formulations have been developed for medically relevant cell types, including human stem cells. However, there has not yet been much impetus among commercial media suppliers to make formulas optimized for cell types like chicken myocytes (muscle cells) or cow adipocytes (fat cells), which come with a completely novel set of requirements for growth and replication. Then there’s the fact that media developed for the biomedical industry isn’t subject to the same cost constraints that we have for food products (no one barters with a hospital over the cost of replacement knee cartilage). If clean meat is going to be competitive with the highly subsidized animal agriculture industry, a hamburger can’t cost as much as an expensive medical procedure. Further innovation is needed to develop lower-cost formulations and media recycling capabilities in order for clean meat to reach price parity with conventional meat. There’s more to meat than just a price point, of course. 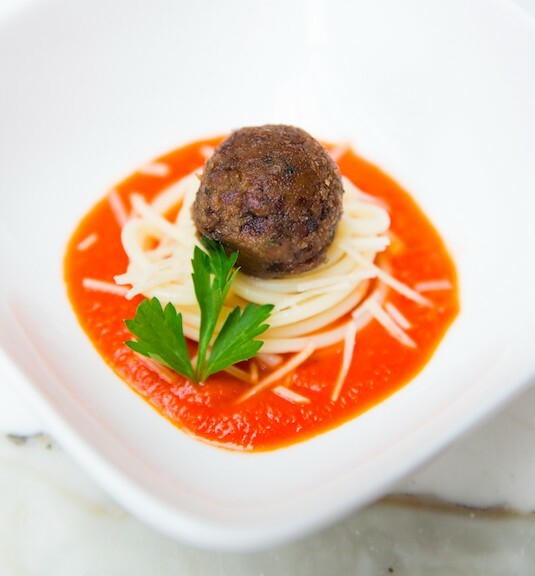 Once lower-cost animal-free media are widely available, the corresponding cell lines must be made to grow in the correct ratio and shape so that clean meat perfectly matches the texture, taste, and look of conventionally produced meat. This is where scaffolding comes in. Scaffolding is essential for producing meat that has the ideal ratio of cell types as well as the familiar shape of conventionally produced meat—whether the goal is to produce ground beef or a chicken breast. Scaffolding directs the differentiation of various cell types to encourage an organized pattern rather than randomly interspersed co-cultures of muscle, fat, and connective tissue cells. 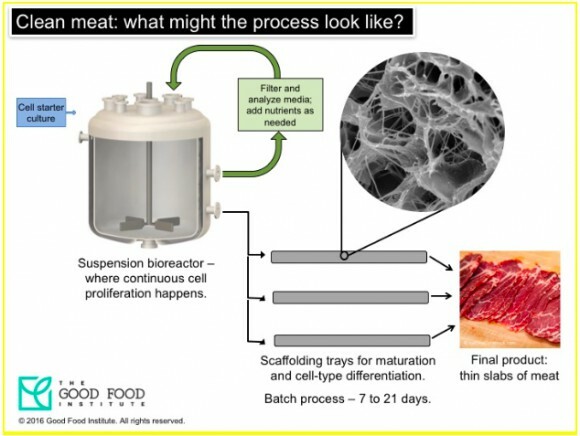 Several materials that are already used in food products are being explored as edible clean meat scaffolds, and the Bay-area startup Geltor is looking at the possibility of creating scaffolding using animal-free collagen. In some cases, these scaffolds serve merely as temporary supports until the cells themselves can form their own support structure. While the first clean meat burgers and meatballs were comprised entirely of muscle cells, a realistic clean meat product must contain different cell types not only in the right ratios but also in the proper arrangement and spatial orientation. Meat is not a uniform product, and the variation from bite to bite adds to the appeal for many consumers. While scientists work to perfect clean meat’s taste, texture, and shape, still more engineers are needed to develop the large-scale bioreactors required to produce enough clean meat to make it to grocery store shelves. As it happens, these bioreactors are the fourth gear in our clock. The bioreactors used for clean meat production function similarly to fermenters in a beer brewery (fermenters are bioreactors). Just like yeast feeds on sugars in a fermenter to produce beer, animal cells feed on media in bioreactors to produce muscle, fat, and connective tissue. The problem? There’s never been a need to create bioreactors specifically designed to produce the amount of clean meat required to disrupt the food system. Luckily, clean meat pioneers have proposed several options for the large-scale production of clean meat, including stirred tank reactors, perfusion reactors, and packed-bed reactors (which, going back to the brewery analogy, is conveniently abbreviated as “PBR”). Developing and testing this equipment simply requires (you guessed it) additional funding and a coordinated engineering effort. At the laboratory scale, biotech companies have designed and built bioreactors that could be applied to clean meat to help differentiate and stimulate cells for better tissue growth. One such unit, the Bose bioreactor by TA Instruments, applies tension to a very small scaffold seeded with cells to mimic the stress these cells would experience in an animal’s body during movement. This encourages the cells to grow, much like exercise helps us bulk up muscle. 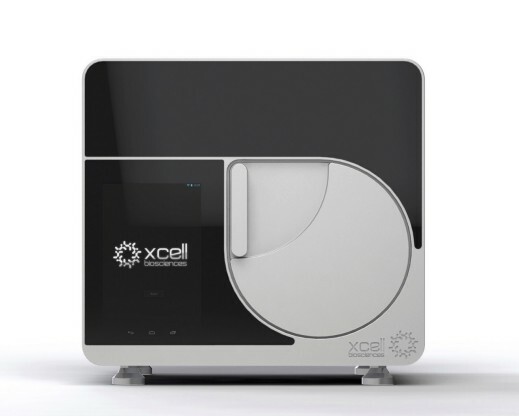 Likewise, cell culturing company Xcell Biosciences has designed the Avatar, a bioreactor that mimics the oxygen levels, hydrostatic pressure, and more that cells would be exposed to in nature, which encourages natural growth. Sounds like a homey environment, doesn’t it? If this technology were used to grow clean meat, the Avatar’s variable oxygen and pressure capabilities could allow a chef to change the type of cells being grown simply by changing the conditions inside the bioreactor. I could (and probably will) write about three more blogs just exploring the flavor possibilities! All of the barriers facing clean meat on its path to commercialization can be overcome with continued work by biologists, engineers, entrepreneurs, and investors. In fact, this was a central theme at the inaugural New Harvest Cellular Agriculture Conference in July 2016 where the top scientists in the field, including Dr. Valeti, Dr. Post, and Dr. Mozdziak, agreed that support from both the public and private sectors will be necessary for the success of this revolutionary technology. Of course, clean meat won’t commercialize itself. That five-year goal is ambitious and is probably only achievable with significant and concerted effort. It’s for this reason that GFI is focused on working with businesses, grant-making agencies, and governments—in addition to scientists and engineers—to encourage the greatest possible progress in the field. To find out more about how you can get involved and what GFI is doing to accelerate clean meat technology, visit our website.